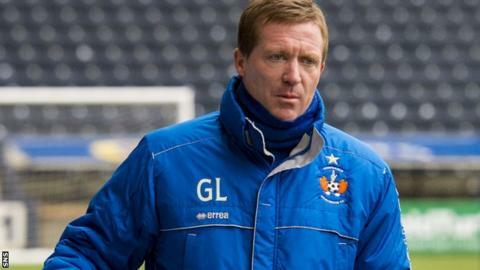 Kilmarnock: Can Gary Locke halt his team's Premiership slide? There is now a grim fascination to the plight of Kilmarnock. The team's run of seven consecutive defeats has seen it slide towards peril and even exhortations about what is at stake and that time is running out have not jolted the players out of their malaise. The latest calamity - a demoralising 3-1 defeat to second-bottom Motherwell last Friday night - was only slightly leavened by Ross County's loss 24 hours later to St Mirren, who have already been relegated. That result has left three clubs in the contest to avoid finishing in the play-off place and facing a two-legged tie with a Championship side to stay in the division. County, at least until they conceded the late goal to St Mirren having pushed too hard for a winner themselves, had been the form team of the bottom half of the table. Their momentum was established and they looked confident of securing their status. They may yet achieve their aim, but the slip-up at the weekend has suggested that nerve is still the most valuable commodity at this stage in the season. Motherwell, too, have intermittently shown signs of their survival instincts. Mostly, they gather around the wiliness of Scott McDonald and the earnest endeavour of Lee Erwin up front, at least providing Ian Baraclough's side with a threat in attack. Their defence is still fragile, and Kilmarnock were never wholly without hope at Fir Park while the score remained 2-1, but Motherwell could also have a psychological edge. They have been in the bottom three for much of the season and are battle-hardened to their circumstances, while Kilmarnock have fallen from a place of safety to the verge of what will feel to them like a drastic fate. The collapse has been sustained, which is a reflection of the difficulty of trying to emerge from a spell of poor form. They have scored in each of the seven defeats, but also conceded 20 goals and some of the defending against Motherwell was hapless. There are contributory factors, most notably injuries to players who otherwise would be regulars in the side, but also a lack of command or authority on the field. That will infuriate the manager Gary Locke, since confidence and morale are often brittle commodities but strong personalities should still be able to exert their influence. The run is particularly galling for Locke since it started after he had been confirmed as the club's full-time manager, having overseen a run of six games undefeated after becoming caretaker manager following Allan Johnston's decision to stand down. Locke was also manager of Hearts last season when a team of mostly young, inexperienced players could not overcome the 15-point penalty suffered for Heart of Midlothian Football Club plc being in administration, and were relegated. Locke has already spoken bluntly of his own desire to avoid the fate of back-to-back relegations as a manager, but there is more at stake than reputation alone. Having reached a debt reduction deal with Lloyds Bank, and brought new figures into the boardroom, the club has been seeking a sense of progress. Locke, widely liked and admired in the game, seemed the obvious choice as successor to Johnston, too, having worked as his assistant since the beginning of the season. The hope was for continuity and for their top-flight status to be guaranteed quickly. Instead, parallels are now with Hibernian, who failed to win their final 13 league games of last season, then lost to Hamilton in the play-offs. In the closing weeks of the campaign, Hibs looked like a condemned team, the players unable to shake off the sense of doom or the seeming inevitability of their fate. Kilmarnock are not at that stage yet - there is hope in the powerful and energetic running of Josh Magennis and the experience of Manny Pascali and Lee Miller - but the team still needs reviving. The most creative player, Alexei Eremenko, has been in and out of the side while Locke tries to establish some consistency of purpose and form. Opponents sense a team that is weak in spirit, though, since belief is now fragile. Ahead of the Motherwell game, Locke spoke passionately about the task in hand and urged everybody at the club, including supporters, to pull together for the cause. There are now only two games left, a visit to Partick Thistle on Saturday and then the visit of Ross County in the final match of the campaign. Motherwell need to win their game this weekend, away to St Mirren, to keep the issue alive into the final weekend regardless of how Kilmarnock and Ross County fare in their games, although they both have an advantage in goal difference over Baraclough's side. For Kilmarnock, alarm seems to be the enduring mood. In their last seven games, Motherwell have won four, drawn one and lost two, the same tally as Ross County. The sense, then, is that Kilmarnock are the team who may be unable to alter their fate. There is time left, but it will be a test of Locke's ability as a tactician and a man-manager to guide his side to safety. The cause is not yet lost, but Kilmarnock need to rally, as individuals and as a group. Hibs were unable to do that last season, and suffered the consequences.